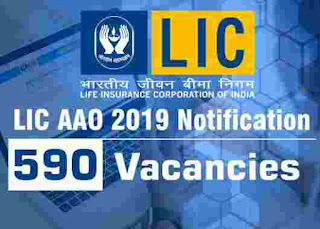 LIC AAO Recruitment 2019 Notification is out. In this video tutorial we explain all about LIC exam Pattern and How to prepare yourself for this LIC AAO Exam. How to prepare for LIC AAO Exam? What is the lic aao exam pattern? Age Criteria for LIC AAO 2019 ? Eligibility Criteria for LIC AAO POST ? What is the Syllabus of LIC AAO EXAM ? What is the Pattern of LIC AAO EXAM ? All these questions answer you will find inside this video. Watch it carefully to know about LIC AAO Exam and About LIC AAO Notification 2019. 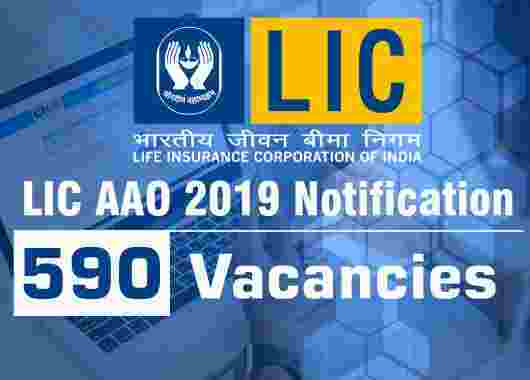 LIC AAO 2019 all Vacancy and LIC AAO POSTS in India. LIC AAO apply online form is active now on 2nd March 2019 to apply online through the official website only. LIC of India Recruitment department conducts AAO Recruitment exam every years. This year notification is out related to the LIC AAO online application. LIC of India recruitment department is looking to fill up total 590 vacant positions of AAO posts throughout India. 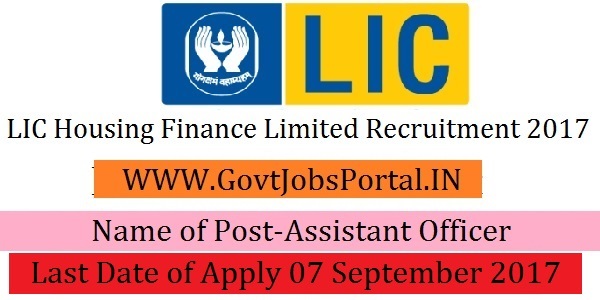 Life Insurance Corporation of India (LIC) invitations for the online applications related to this LIC AAO Recruitment 2019. All eligible Indian Citizens can apply for this recruitment for appointment to the post of Assistant Administrative Officer (Generalist/ IT/ Chartered Accountant/ Actuarial/ Rajbhasha). Applicants must apply through On-line mode only by using LIC of India official website. No other means/mode of application will be accepted. 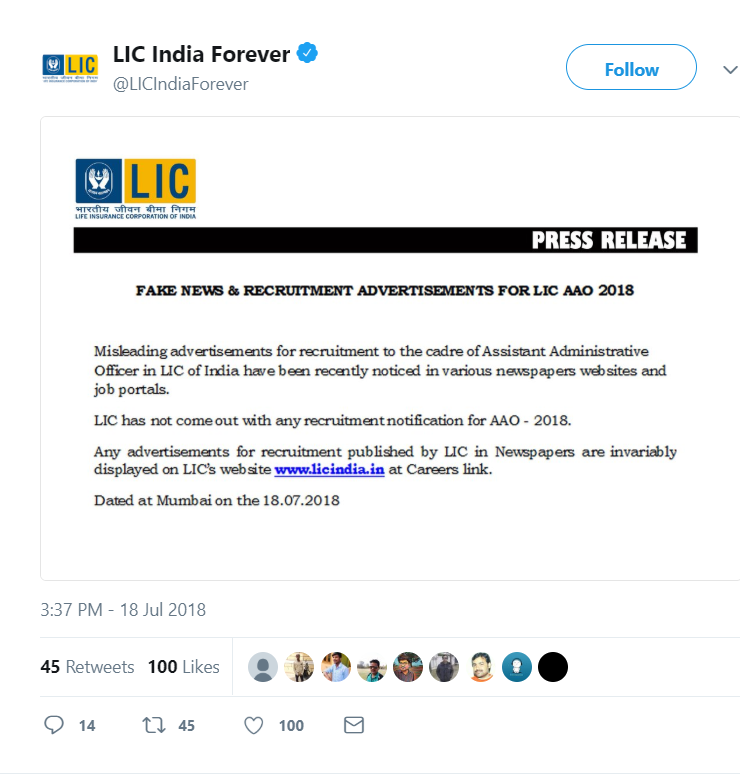 LIC has clarified that they have not released any notification for AAO posts and that candidates should avoid reading such news. 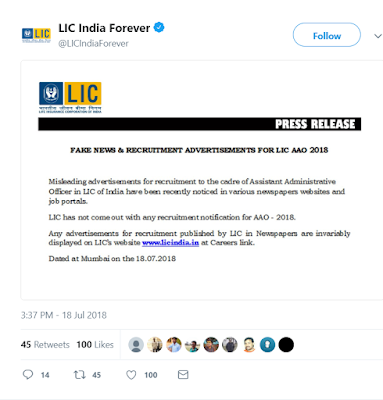 LIC on their official Twitter account clearly mentioned this thing with an Image. We share that image below. LIC Housing Finance Limited is going to recruit fresher candidates in India for Assistant & Assistant Manager Posts. So, those candidates who are willing to work with this organization they May apply for this post. Last Date of Apply 07-September-2017. Total numbers of vacancies are 264 Posts. Only those candidates are eligible who have passed Graduation (minimum aggregate 60% marks) from a recognized university/ institute & MBA in any discipline from a recognized university/ institute/ board (minimum aggregate 60% marks). Indian citizen having age in between 21 to 28 years can apply for this LIC Housing Finance Limited Recruitment 2017. 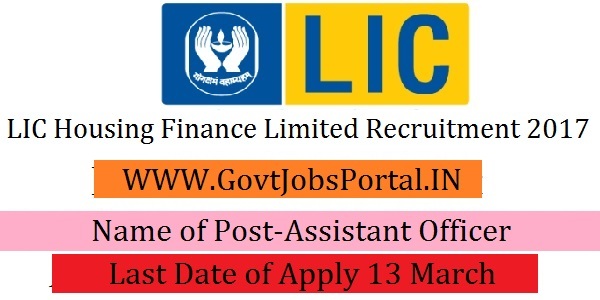 Those who are interested in these LIC Housing Finance Limited jobs in India and meet with the whole eligibility criteria related to these LIC Housing Finance Limited job below in the same post. Read the whole article carefully before applying. Educational Criteria: Only those candidates are eligible who have passed Graduation (minimum aggregate 60% marks) from a recognized university/ institute & MBA in any discipline from a recognized university/ institute/ board (minimum aggregate 60% marks)..
Age Criteria: Candidates age limit should to be possess minimum age 21 years & maximum age 28 years. What is the Process for Selection this LIC job? LIC Housing Finance Limited is going to recruit fresher candidates in India for Assistant Posts. So, those candidates who are willing to work with this organization they May apply for this post. Last Date of Apply 13-March-2017. Total numbers of vacancies are 50 Posts. Only those candidates are eligible who have passed B.Com/BBA/LLB/M.Com in any discipline from a recognized University or its equivalent. Indian citizen having age in between 21to 35 years can apply for this LIC Housing Finance Limited Recruitment 2017. Educational Criteria: Only those candidates are eligible who have passed B.Com/BBA/LLB/M.Com in any discipline from a recognized University or its equivalent. LIC India is inviting application forms from Indian citizens for the recruitment to the posts of Advisor and LIC Agent on direct Recruitment basis. As per requirement of LIC of India, total available posts are 320 (Advisor-260 and LIC Agent-60). Qualification for Advisor posts is HSC; Qualification for LIC Agent posts is HSC, Diploma, Graduation and Post Graduation degree from a recognized university/Institute. Selected candidates will be posted at Maharashtra. Mode of application is offline. Last date to send application forms along with relevant documents and testimonials to given address is 30th November, 2016 (30.11.2016). The official notification has been uploaded. 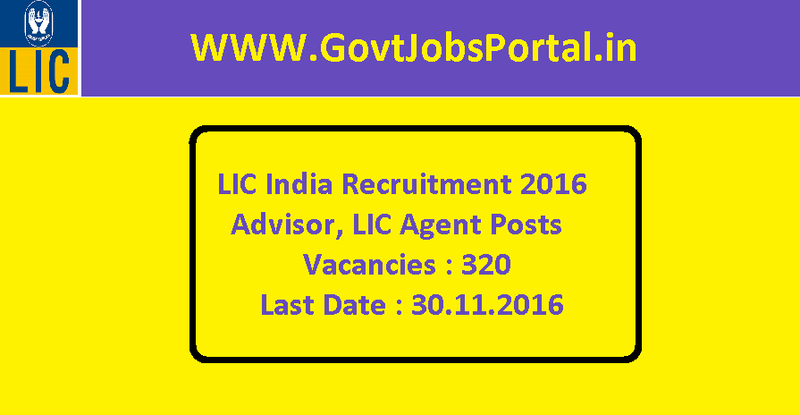 Read full information for LIC India Recruitment 2016 for 320 Advisor, LIC Agent Posts. Selected candidates will get monthly payment, Please go through official notification. Last date to send application forms along with relevant documents and testimonials to given address is 30th November, 2016. Qualification for Advisor posts is HSC; Qualification for LIC Agent posts is HSC, Diploma, Graduation and Post Graduation degree from a recognized university/Institute. Upper age limit for aspirants must be 33 years and lower age limit must be 18 years as on the closing date of application forms. Short listed candidates will be called for personal interview round. Candidates will be short listed based on their academic merit. LIC India department requires hard copy of application forms i.e. Mode of application is offline. Last date for receipt of application forms is 30th November, 2016. A) Download application from the website of LIC India. B) Fill with the details of name of the candidate, DOB etc. C) Paste your recent passport size colour photograph at designated place. D) Put your signature and send to given address on or before 30th November, 2016. Selected candidates will be posted at Maharashtra. Candidates should fill up all the columns of the application correctly. Total vacancies as specified in the notification is subject to change. LIC India invites application forms from eligible candidates for the recruitment of Advisor Posts. As per notification of LIC India Total no. of posts is 260. Interested & Eligible candidates may send their applications to the required address on or before 31/12/2017. The official notification has been uploaded and the information regarding these posts of educational qualification, age criteria, selection process etc is mentioned below. Candidates may download official notification from below link. Read information for LIC India recruitment 2016. Last date for submitting hard copy of application form 31st December, 2017. Eligible candidates must have done 10th or its equivalent from any recognized University/Institute. Check the official detail for the complete detail. Candidates lower age limit should be 18 years. Otherwise they will not eligible for Recruitment process. Candidates are required to send application forms along with prescribed documents on or before 31st December 2017. For complete details see the official detail given below in this post. 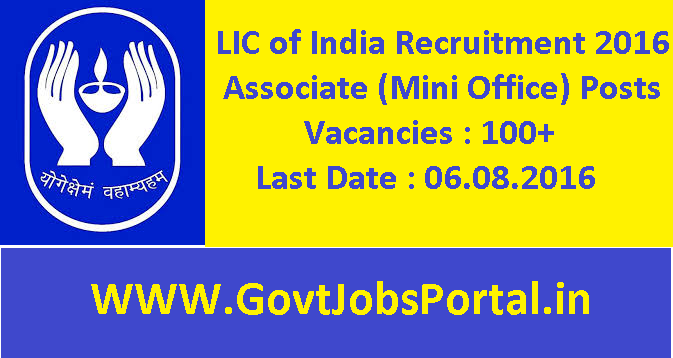 Life Insurance Corporation of India is inviting application forms from all eligible retired officers of LIC of India for the recruitment of Associate (Mini Office) Posts on contract basis. Contract period is two years. Total posts are 121. Application mode is offline. Candidates may send their completed application forms to given address and E-Mail to nzassociate@licindia.com on or before the last date of 06th August, 2016. The official notification of LIC of India Recruitment 2016 has been uploaded and all details are mentioned below. Any query and problem just comment in box below, we will contact you immediately. Read full information for LIC of India recruitment 2016. Employees who will be selected for Associate (Mini Office) Posts, will get fixed remuneration of Rs.20,000/- . Closing date for submitting application forms 06th August, 2016. Employees who have retired in the cadre of Assistant Administrative Officer, Higher Grade Assistant, Administrative Officer, Divisional Manager, Assistant Divisional Manager and Senior Divisional Manager. Maximum age limit for employees shall not be more than 63 years as on 06th August, 2016. Selection committee will conduct personal interview for all candidates & subsequent Pre Engagement Medical Exam. Life Insurance Corporation of India requires hard copy of application forms. Candidates may send their completed application forms to given address and E-Mail to nzassociate@licindia.com on or before the last date of 06th August, 2016. B) Attach self attested photocopies of relevant certificates to hard copy of application form and send to given address. C) Address is "The Regional Manager (P&IR), LIC of India, Zonal Office, Jeevan Bharti, Tower II, Connaught Circus, New Delhi-110001". D) Closing date for submitting application forms 06th August, 2016. Canvassing in any form of candidates, will be a disqualification. No application form will be entertained beyond the stipulated date. Department will not accept incomplete application forms. 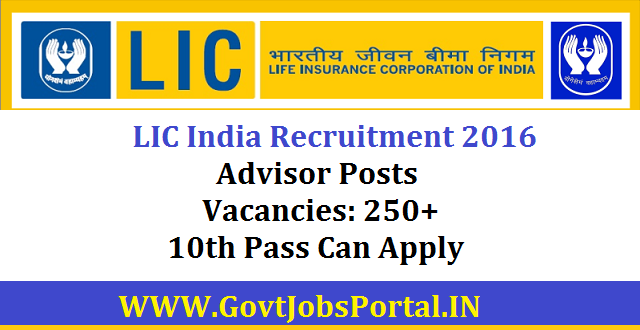 Life Insurance Corporation of India (LIC) introduce Insurance advisor posts in March 2016. Appointment for these all posts on regular based only. Apply to these posts through online procedure. As per notification total number of posts is 500. The official notification has been uploaded. Details of Educational qualification, Age Criteria etc is below. Please read total information carefully and download official notification from below link. Any query and problem just comment in box below, we will contact you immediately. Read full information for Life Insurance Corporation of India recruitment 2016. Candidates who will be selected for Insurance Advisor posts, will get the payment of Rs.8700/- to Rs.34800/- per month plus other allowances. Closing date for registering online process is 31st May, 2016. Qualification for Insurance Advisor posts is Secondary School Certificate or its equivalent qualification with good academic records from a recognized Board or University. Age limit for all candidates should in between 18 years to 65 Years As On 14th March, 2016. There is relaxation in upper age limit for candidates as per rules of LIC. Application fee (non-refundable) is nil for all candidates. Please visit official notification to get more details. Engagement of these Insurance Advisor posts would be depended on interview only. Candidates will be short-listed for interview based on merit. Online application forms for these posts are required by department. Please fill the form with true based information only. Last Date of to apply through online process is 31st May, 2016. After this you can’t apply. A) Interested candidates should apply for all these posts through online process. Visit official website link given below. B) Check Posts details and all information regarding post. C) Fill an application form with truly based information must by following tips in this section. E) Click on ‘Submit’ button and take a 2 copies of application print for further use. Do not fill the form with artificial information, otherwise department will reject their applications . Please apply online for these posts on or before last date only. As we all know, LIC has scheduled the LIC AAO Exam 2016 on 5th, 6th & 13th March 2016. So for that we are sharing below in this post the Exam Pattern and Syllabus for this exam. The Exam will be online & of total 2 Hour duration & will contain total 160 questions. As per the notification released by LIC, Exam Pattern of LIC AAO is as follow. Check the below image carefully. Latest Government jobs opportunities under LIC, Life Insurance Corporation of India for Officer level jobs in India. LIC introduces an official notification in which they are inviting all Indian candidates to apply for AAO Posts. Through their official notice they said that all eligible Indian candidates can fill up their online application for the 700 posts of Assistant Administrative Officers through online process. For more information related to Educational Qualification, Age criteria and other Eligibility required under this latest govt jobs for LIC Recruitment 2016 process read the below article carefully. Also must read the official advertisement in detail before applying. Profile Name: Assistant Administrative Officers (AAO) Posts. Educational Eligibility: Candidate should have done Degree/Graduation/Post Graduation in any discipline from a recognized University. Check official Advertisement for complete detail. Age Bond: Candidate’s should have their age between 21 to 30 years. Selection Process: For this recruitment process of LIC the criteria of selection will be based on online test followed by Interview. Process for Applying: Candidates have to submit the dully filled application form online through their official website on or before 5th January 2016. You can check the details from the given link below.